“Just when you despair of the mystery novel along comes A Man Alone which has the three essentials of great writing, a keep you on the edge of your seat narrative, and a burning intensity to the style…Highly entertaining.”- Ken Bruen, author of Purgatory. 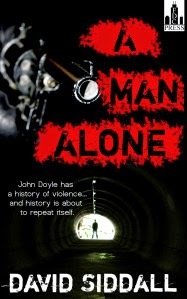 “David Siddall’s brilliantly hard-boiled novella A Man Alone is a gripping urban western worthy of a Walter Hill film.” – Paul D Brazill, author of Guns of Brixton, Roman Dalton – Werewolf PI. “A compact, paunchy thriller that takes a classic situation – what happens when one Competent Man won’t back down? – and adds some clever twists. Siddall writes with great skill and verve, wasting no words as he coolly maps out the route taken by his maybe-hero.” – David Longhorn, editor of Supernatural Tales.